Did you know that German is the 3rd most common language taught in American schools? Whether you’re looking to brush off skills you learned years ago, interested in the language of your ancestors, or wanting to have a grasp of basic German prior to traveling through Europe, now is the time to start! Rocket Language's German lessons program is simple and effective, giving you the skills you need to learn the modern German language. Whether you are new to the German language or already have some experience with it, Rocket German will improve your ability to use German conversationally. Twenty-five minute interactive audio lessons (33). These lessons contain conversational German, focusing on common phrases and vocabulary used in everyday life. Listen to each lesson as many times as needed to train your ear to respond to each prompt. Language & Culture Lessons (31). 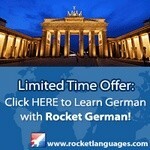 Rocket German provides step-by-step explanations in English to help students learn exactly how German works. Voice recognition phrases (2,000+). Rocket Record allows you to improve your pronunciation by evaluating your recorded phrases against its voice recognition tool, bringing your accent as close to a native level as possible. Flash Card sets (64). Improve your active recall of the phrases you learn with a set of Flash Cards for each and every lesson. 24/7 Forum and Email Support. Rocket German believes there's no such thing as a dumb question. Students have unlimited access to discussion boards and forums where they can get answers from German teachers, native speakers, and fellow German students. Other German language course features include the My Vocab vocabulary builder, the Phrase Finder, progress tracking with badges and leaderboard access, lifetime course access, and three "Survival Kits" that help students quickly master targeted vocabulary within specific conversational situations. Rocket German is so confident that students will love their program, they offer a four-hour set of lessons as a free trial with no credit card information required, as well as a 100%, 60-day money-back guarantee. And, if their customer reviews are any indication, Rocket German is a terrific value for the investment with more than 1,500 users rating the program as a perfect five stars. Learning a new language may seem daunting, but Rocket German has gone to great lengths to help students grasp conversational German quickly, easily, and while having a good time doing it. We love their multifaceted approach to language acquisition, their free trial, and their friendly approach to customer service. If speaking Deutsch is on your to-do list, Rocket German is our top recommendation. Rosetta Stone is a well-known, highly effective language-learning program. Their approach to language learning is known as "Dynamic Immersion," which utilizes interactive technology with native speakers. Rather than teaching through translation from English to German and back, or through rote memorization, Rosetta Stone prioritizes helping students learn naturally, in the same way that a child learns his or her first language. Rosetta Stone offers a wide range of ways to access their courses. At the time of our review, there appeared to be special pricing in place, depending on whether the course is accessed as an online subscription ($149 for 6 months, $179 for 12 months, $199 for 24 months) or instant download ($199 for levels 1-5, $179 for levels 1-3). The site was somewhat unclear with respect to its "lifetime" membership; while lifetime access for a single user seems to match the description, the "lifetime" German Family Pack for up to 3 users is described as access for 24 months. We were pleased to see that Rosetta Stone has updated its guarantee/return policy: in the past, their 30-day, no risk, money-back guarantee only applied to their CD products, but it has since been expanded to include any of Rosetta Stone's Personal or Homeschool editions, no matter if the product is used as an online subscription, download, or CD-ROM. Rosetta Stone is one of the most professional-looking products we reviewed. There are many reviews, both on their site and on others, that describe learning German with Rosetta Stone as enjoyable, helpful, and a good value for the investment. However, there are nearly as many reviews that criticize Rosetta Stone for not delivering what it promises: namely, language acquisition that happens as fluidly and naturally as one learns as a child. Also, it is difficult to deliver a truly immersive experience without actually living within an environment of German speakers, despite Rosetta Stone's best efforts. Overall, using Rosetta Stone is a very solid option for beginning to learn German - as long as students understand that no program is likely to deliver true fluency in a box (or as part of an online subscription). Pimsleur is one of the most recognizable names in language instruction. Known for teaching languages in basic 30-minute audio lessons, Pimsleur continues to be the method of choice for students who learn best by hearing. Prospective customers can download a free 30-minute German lesson from the website, to see if the style works well; we found that the trial lesson left us with a good understanding of a simple conversation. Unfortunately, the trial lesson doesn't include any access to the non-audio portion of Pimsleur's German program included with the software DVDs, which includes flashcards, matching games, and other visual components. We would have liked to see more of what Pimsleur has to offer beyond audio lessons, in order to more accurately compare its German instruction to other programs we reviewed, and especially because approximately 40% of students are visual learners (compared with 10% of students who learn best auditorily). Pimsleur does offer a Proficiency Guarantee, but the terms are very specific: users must purchase a Pimsleur Level 1 program, complete the course, and take a novice-level test on an independent website. If the user is unable to pass that exam, Pimsleur will issue a full refund. We're not sure if this applies to a purchase made that included levels 1-4. Of all the products in our reviews, Pimsleur is the most expensive: four levels of German provided via DVD (i.e. including both visual and audio lessons) sells for $450 and includes 120 lessons, while single levels are available for $150. And, while you might think that you'd save money by purchasing just the MP3 or CD edition, you're in for a shock: 81 hours of MP3s costs $550, while those same lessons cost $1,190 on CD! Because of its strong emphasis on auditory learning, we recommend Pimsleur for those who want to learn a language on the go: in the car, on an MP3 player (though you may want to download the audio tracks from the DVDs rather than buying the MP3s, based on price), or while working around the house. Innovative Language's GermanPod101 program provides a wide variety of language instruction levels, from brand-new language learners to those looking to move to a new level of German fluency. In order to access this "one-time offer", you'll need to pay $1 as a "bandwidth fee". Otherwise, click on the "No Thanks" link and it will take you to your main account page. On that page, we got yet another "special offer", explaining that we had now been given a 7-day free trial with access to the entire lesson library and Premium tools, but we could get a 10% discount if we upgraded to a subscription plan that day. Fortunately, the sales pitch seems to finish there, as you can jump directly to audio Absolute Beginner Lesson 1, "Is Your Coffee as Strong as Your German Apologies?" In that sample lesson, which navigates a conversation between two strangers when one spills on the other and needs to apologize, we particularly like that the audio speed can be changed right on the main screen if you need to hear the lessons more slowly (or more quickly!). Also be sure to check out the spot at the top of the lesson that says "Download PDFs". Here you'll find a transcript of the lesson, lesson notes (including cultural notes and grammar explanations), and checklists to help you track your progress through the materials. From that point, we found it difficult to know the recommended path(s) for logically progression through the lessons. We saw that there are also video lessons, so we went to the series "Learn German in Three Minutes" found under the "Lessons" heading on the main page. Those videos made more sense than the audio files, but we weren't sure if we needed to follow the instructions to "add course to dashboard". Additionally, the learning dashboard shows the recommended lesson progression under the "My Pathway" heading, access to flashcards and other tools, and access to the "My Teacher" feature included with Premium Plus memberships. We recommend that students go to the Lessons navigation at the top of the page, and select "Learning Paths": here you will find groups of lessons categorized as Absolute Beginner, Beginner, Intermediate, and Advanced. The content initially looks skimpy - for example, under the "Advanced" section of the Learning Paths, it appears to only have two areas of content. However, as we took a closer look, we noticed that the "Flexing Your Fluency" area includes a total of 80 lessons, comprising a total of just over four hours of instruction. We were initially confused by the pricing for Innovative Language's packages. On one page, it said that their packages were priced at $4/month for the Basic plan, $10/month for the Premium package, and $25/month for Premium+; however, on the main pricing FAQ page, the prices were listed as nearly double those amounts. Why? The higher prices are for a 1-month subscription, and the lower prices reflect a 50% discount given for a 24-month subscription. Keep that in mind as you decide which plan meets your needs and your budget, and be sure to compare the features offered at each subscription level (for example, interactive voice recording is included with Premium and Premium+ only, while printer-friendly lesson notes are included with all paid memberships). Innovative Language does offer a guarantee. If you are unsatisfied with your membership at any level, you may request a refund within 60 days. Be aware that you will only be refunded for the unused time on your membership plan. Because of the breadth of the content offered and the solid variety of teaching approaches (such as audio, video, MP3 downloads, mobile apps), we give Innovative Language's GermanPod101 a respectable rating. This rating would improve with fewer hoops for prospective customers to jump through in order to check out what the German program has to offer, and less emphasis on the sales pitch. Transparent Language's online German program bills itself as providing "radically better language learning, in one complete experience". Like most of our higher-rated language learning programs, Transparent Language makes use of a variety of techniques - speaking practice that allows users to compare their speech to that of a native speaker; questions that involve multiple choice, dictation, and listening recognition; detailed grammar lessons to help learners understand the mechanics of German; and much more. We didn't find much to indicate what makes Transparent Language's German program exceptionally different from other providers, though what they do offer seems to be on par with more commonly-used programs. We do like that Transparent offers a 14-day free trial of their online program, and that no credit card information is required to activate that trial period. Many customers report that Transparent Language's structure is much less rigid than other German programs, so we recommend that new users take advantage of that free trial to determine if they have the self-discipline required to make progress with Transparent's more flexible approach to language learning. We also appreciate that Transparent Language offers a full refund for all of its products, within six months of purchase for any physical/downloaded product, and a full refund prior to the next billing cycle for Transparent Language Online. One unique aspect to Transparent Language is the ability to have live instruction and tutoring in German. Their offerings are not inexpensive - $299 for an 8-week, customized online course that meets once a week, and/or $99 for 90 minutes of private online tutoring at the student's proficiency level - but for students who want face-to-face instruction or help without leaving home, Transparent Language is one of the few providers that offers it. LingQ (pronounced like the word "link") teaches German through authentic use: readings from actual German print material such as books and newspaper articles, downloading audio lessons to review, and connections with native speaker helpers and tutors. While the premise of LingQ is solid - using real-world texts, audio, and communication with native speakers of German to master the language - the sample lesson provided in the demo video was less than impressive. The methodology behind LingQ's approach to teaching German appears to be based solely on the experience of the program's creator, Steve Kaufmann, rather than on any tested, proven approach to language acquisition. While he may have had the deep motivation he claims is necessary to master a language using the LingQ method, reluctant language learners would likely have a different experience and thus less success. We also were dissuaded by the "pay to play" aspect of LingQ's German program: in order to work directly with a native speaker, students have to use "points" that either come with the highest paid membership or that are purchased separately. For example, a one-on-one conversation with a native speaker costs 500 points for 15 minutes, which translates into $5, or a 100-word writing correction for 333 points ($3.33). In our opinion, there are many ways to get the help of native speakers, both online and in person, that can be accessed for free rather than paying for each interaction. On the other hand, there are many LingQ testimonials, both on the site and elsewhere that indicate that the system does work for some students of German. We would recommend that anyone considering LingQ take advantage of the free membership first, to see if the structure of the German program is a good fit for their learning style and motivation level. Unforgettable German promotes speed-learning using their proprietary mnemonic method known as "Linkwords", which helps users memorize vocabulary by associating German words with familiar English ones (for example, "The German word for BOTTLE is FLASCHE. Imagine a bottle FLASHing past your head"). With that visual imagery in mind for ten seconds, students are better able to retain the meaning of each vocabulary word for long periods of time. Unforgettable German includes four different levels, each with approximately 10-12 hours of instruction. The website features a six-word German demo, to allow prospective language learners the opportunity to try out their "Linkwords" technique, including a grammar explanation for the words being used. While we felt that the associations did help with vocabulary acquisition, we felt that including images would have made it even more likely to retain the words being taught. Also, the grammar lesson was quite short and basic, which might not lead to fluency in actual conversation. We absolutely recommend that customers try the sample lesson, to determine if the "Linkwords" method is a good fit for their learning style. We appreciate Unforgettable German's satisfaction guarantee of getting a full refund for any reason within 30 days of purchase. Unforgettable German can help language learners make connections to more easily remember targeted vocabulary words. This could be useful for students who are currently studying German and who need a boost in retaining the words they are learning. However, with somewhat weak grammar lessons, and vocabulary that seems to be taken out of context (for example, the demo taught words like "lobster" and "skirt"), Unforgettable German feels more like a fancy set of flashcards than a comprehensive language program. For these reasons, we recommend that those looking to learn or improve their German consider one of the more highly-rated, comprehensive products we've reviewed. Strokes International's Easy Learning German was created to meet European Union learning standards for beginning, intermediate, and advanced business learners. Unfortunately, it is difficult to get past the errors on the website - "dictionnary", "conjugations with 1400 verb" - and utter lack of details provided under "Program information" in order to evaluate how well (or poorly) Strokes delivers on that assertion. There is a three-lesson trial available for download, but given the lackluster appearance of the website we opted not to test that file. Similarly, the free mobile apps referenced at the top of the page have very few reviews, and the apps themselves haven't been updated since 2014, adding to the impression that Easy Learning is not a high-quality language learning platform. Also, on the "Shipping & Returns" section of the website, there is no information given with respect to returns, only costs for shipping within and outside of Europe. If you're looking to learn German, we strongly recommend that you consider one of our more highly-rated programs, as Strokes International's Easy Learning simply cannot demonstrate that its program will help you get there, or that you will have any support whatsoever after making a purchase. TopConsumerReviews.com has reviewed and ranked the best German Lessons available today. We hope these reviews help you learn one of Europe’s primary languages with ease and enjoyment!